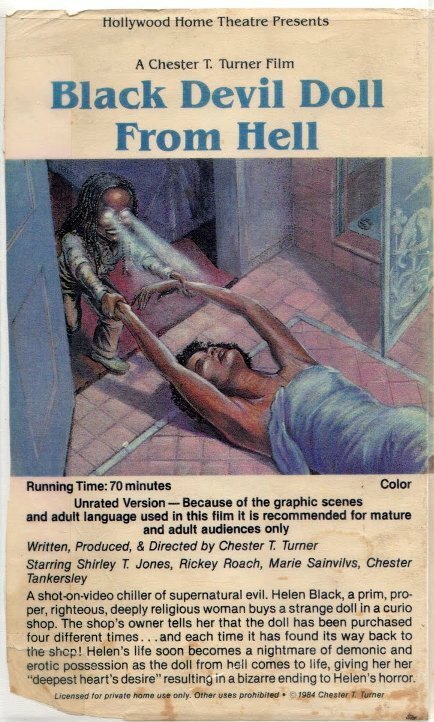 BLACK DEVIL DOLL FROM HELL: The Psyche-Shattering Id Of Shot On Video Horror, Personified – Schlockmania! If horror cinema ever had a period that could be defined as its “most insane” era, that period would have to be the second half of the 1980’s. This is because a confluence of the genre’s popularity, the availability of cheap consumer-level video technology and the VHS video market’s need for product allowed the genre to be flooded with countless shot-on-video horror flicks. It was a time when you didn’t need the tools of mainstream cinema, a budget or even a working understanding of filmmaking to get your vision out to the VCR-owning masses. All you had to do was get a camcorder and let it rip. As a result, many people who would have never made any kind of movie tackled the horror genre – and their work has been testing the aesthetics and sanity of cult cinema anthopologists ever since. 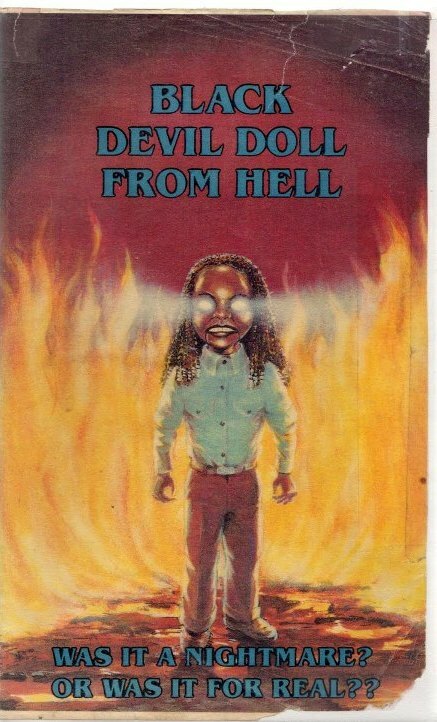 One of the most notable shot-on-video horror flicks from this era is Black Devil Doll From Hell. The work of one Chester Turner, it tells the tragic tale of repressed, religious spinster Helen (Shirley L. Jones). Her lonely life takes a dramatic change when she visits a curio store and takes home a dreadlocked ventriloquist puppet. The store owner claims it can give the owner their most “heartfelt desire” – and Helen gets more than she ever expected when the puppet comes to life, ties her up and ravishes her! What follows is horrifying on multiple levels, most of them unintended but no less staggering for the audience. It is not an exaggeration to say that Black Devil Doll From Hell is one of the damndest things you’ll ever see. Chester Turner’s style of filmmaking is so untutored and utterly personal that it bypasses the concept of bad movies and goes directly into outsider art. His script uses a predictable horror anthology show plotline but manages to fill it with demented, truly unpredictable (and un-Hollywood) sexual content. He wrote, directed, edited and scored the film and achieves a sort of accidental, minimalist blankness that allows the viewer to concentrate on how utterly bizarre the content of the film is. By the time the puppet begins sexually assaulting the heroine, you’ll feel like you’re watching the Videodrome version of a kid’s t.v. show. The film also features a similarly untutored but very brave performance from Jones as the heroine. She’s not equipped in the thespian sense to tackle the weird “sexual awakening” character arc the film saddles her with but she dives in with both feet nonetheless. She bares both body in soul in a way that commands respect, even if you don’t like her acting. The fact that she could tackle a role where she is raped by a puppet and ends up liking it… well, few would be brave enough to even try. Like the film itself, she just goes there and never looks back. In short, Black Devil Doll From Hell takes whatever you dream trashy, shot-on-video horror is capable of and doses it with PCP. It’s not the kind of thing most people are ready to handle – or are willing to handle – but it’s a film you must see if you’re interested in the outer limits of horror’s VHS era. If you answer to that special calling, you’ll find the kind of brain-scorching weirdness that no conventional horror film could ever dream up. Great review, Don! With people weighing in on this one-of-a-kind viewing experience here and there, yourself and Ian Jane have really nailed what actually watching it is like! “Videodrome ver­sion of a kid’s t.v. show” is right! Thanks for reading, Ian! Glad to see you making a comment – feel free to drop in anytime.